fact & fancy: You're Nuts! Not in Brooklyn? Get a little piece of Fact & Fancy sent to your doorstep! We just listed our first Fact & Fancy design on Etsy. Have a peek! 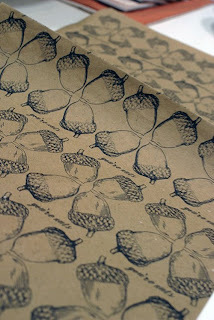 This wrapping paper (designed, printed and packaged by Danielle) is also available in the shop. We're also experimenting with a new online shop through wunderbloc - check it out.